Joen Wolfrom is an artist and teacher who moved from making traditional Log Cabins to creating spectacular quilted landscapes that celebrate the beauty of our world. Through years of trial and error she perfected methods that enabled her to accomplish aesthetically what established quiltmaking methods could not. Her book shares her discoveries and observations. She believes one needs only a working knowledge of the sewing machine, a love of nature, and perseverance to learn the techniques and practice the exercises included in her book. A handy glossary, suggested reading list, bibliography, and source of suppliers known for their fabric variety or for hand-dyed fabrics are included. This is a superb how-to filled with solid instruction, valuable techniques and practice exercises, and powerful inspiration in the form of 46 color plates of scenes created by Joen and other quilters. In Landscapes & Illusions, Joen, a teacher, lecturer, and creator of site-specific commissioned art, has generously shared the results of ten years of study, experimentation, and creative endeavor in the art and craft of translating nature’s glory into fabric. The forty-six colored photos in the center of the book will absolutely dazzle you—start with them. Then read the first four chapters on color to see how Joen gets these effects. Then study the glossary, which makes this technical subject easily accessible. Finally, you are ready for the chapters on construction and for the lessons and exercises. Even if you never plan to make a fabric landscape (and this book may change your mind) you owe it to yourself to feast your eyes on this book and to apply to your own work the color insights provided here. Beautifully written and beautifully produced, Landscapes & Illusions is a must for every fabric artist’s library. Joen Wolfrom has compiled a bountiful fund of information gained from her efforts in creating the spectacular landscapes for which she is well known. She shares not only her considerable knowledge of the use of color to create images and illusions, but also her design, construction, and finishing techniques. Several exercises are suggested on strip-piecing construction. These are to aid in such problems as the formation of mountains and valleys. In addition, five lessons are presented which, if followed,, the quiltmaker through creating visual depth, luminosity, and luster in strip-pieced landscapes. Excellent color photographs of 46 fabric scenes by Joen and others illustrate these concepts. The quiltmaker wishing to expand comprehension of the use of color and creating illusions would do well to add this book to his or her library. 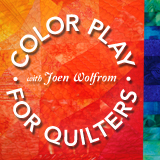 Joen Wolfrom’s thoughtful book encourages the beginning and the more advanced quiltmaker to explore new techniques and design ideas. It includes chapters on color study and special visual effects as well as a procedural guide and a glossary of terms. Even if the readers do not want to quilt the landscape images which are the focus of the book, every quiltmaker who needs courage to design his/her own works will find this a useful addition to their library. In her book Joen shares some ways to create illusions and landscapes. Her gallery of photos of sample quilts shows examples of how this has been done successfully. She tells you how to create mist, sky, clouds, land, mountain ranges, reflections, and more. With her help and the examples shown, you, too, can create beautiful landscape or illusion designs. This is a delightful book and one that will fill a gap in creative art quilting. It sets out most successfully to open our eyes to environmental scenes, landscapes, seascape and skyscape, and to help you develop a sensitivity to the beauty of nature and thus to the real understanding of the use of colour. Although Joen sets out to inspire you to look at the great scenes of nature all around you, she is also intensely practical. Sic exercises introduce you to the basics of strip piecing eight lessons lead you through the whole process of creative fabric landscapes and there are ten basic landscapes illustrated in pattern form, so that you can try one or two samples before you start creating individual scenes of your own. Quilters in Australia are very interested in environmental wall hangings and I am sure this book will prove very popular. Joen is obviously a very creative person. She explains that she became interested in depicting natural scenes, but was soon very dissatisfied with the restrictive features of the whimsical appliqué scenes most often presented. She yearned to recreate the majestic landscapes of her surroundings. She persisted with her visions until she was able to depict them in fabric. She says all you need is a working knowledge of the sewing machine, a love of nature, the desire to learn and the ability to persevere. This book to guide you will be a big help in achieving your ambition. A stock of fabrics in sophisticated colours would be a big help. The only source of such diversity is either to dye them yourself or locate a supplier of a colour range of hand dyed fabrics.